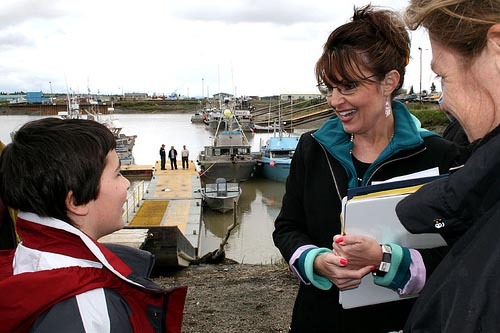 Rubenerd: Palin pick backfired amongst younger voters! Palin pick backfired amongst younger voters! Now would be a great time visit Alaska, because Sarah Palin isn't there! Well look at that, it appears among the young voters the stunt was supposed to enthrall and energise in the first place, John McCain's choice of Sarah Palin as his vice presidential running mate has appeared to have backfired. According to an article on the Adelaide Now website (the online version of our local newspaper), a Harvard University survey of 2400 people aged 18 to 24 found that while 25% claimed the decision would make them more likely to vote for John McCain, a whopping 40% claimed the decision made them less likely. That's right, for every person who was swayed to vote by the decision, it backfired on two. By comparison, Barack Obama's selection of Joe Biden marginally increased support for his ticket. My generation has been getting a bum rap for a long time now for our disorderly conduct, self centred nature and lack of respect for our elders… you know, all the charges the generation before last labelled our parents with too. It's good to see that in the sea of silliness that is politics there are some people within my generation's ranks at least who posses a certain degree of inaccurately-named common sense. I hate to admit it, but this story gave me a genuine case of schadenfreude! John McCain isn't exactly a great choice, but Sarah Palin is a joke, plain and simple. And before you say that I'm a joke for saying it, I admit I'm shamelessly copying Salman Rushdie's description. Older post → My MacBook Pro likes bras… whoa, what?